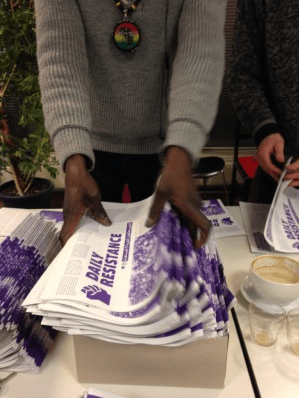 We have published the second issue of the newspaper “Daily Resistance” (You can read it as PDF here), and now it’s the time to bring the paper to the hands of people living in the lagers. We are looking for people who have contact to so-called refugees in lagers and can help to spread Daily Resistance. Where can you get the newspaper? You can pick up copies at the bookshop ‘Leseglück’ in Ohlauer Str. 37. They are open from 10:00 – 19:00 every day exept sunday. Just go there and ask for how many copies that you want. We are a mixed group of people and activist in Berlin who fight against isolation and lagers in oranienplatz and other places. After publishing the first issue, we have received a lot of positive feedback. Many people srarted to write for the newspaper or distribute it in lagers. Initially, we printed 2000 copies. Soon they were all gone and we realized we have to print more. In the end, we distributed more than 5000 copies in Berlin, Munchen, Jena, Erfurt, Bremen, Darmstadt, Kiel, Hannover, Delmenhorst, Landshut, Oldenburg … also in Manchester and Vienna. In Thessaloniki, people managed to throw packages of newspapers over the fences of a closed lager. This is all incredible and gave us the energy to continue. We like to thank everybody who moved the newspaper forward and invite all to join in the fight of breaking the isolation in lagers. This is a communal newspaper, feom people for people. What’s written in the second issue? In the second issue there are texts from people living in the Lagers around Germany and also from the freedom fighters who already got papers and still continue the struggle against the larger system. for example from very wellknown groups like womem in Exile, The Voice Refugee forum, people from the Berlin Refugee movement like Turgay Ulu, Bino, Adam Bahar, Tresor, Mai Shutta and International woman in space, CISPM, The street roots and more. In this issue a lot of activists write about the so called Welcome Culture in combination of the new restrictions to the asyl law and also about the Köln silvester night happening and the sexual violance towards refugee women in lagers. More than that different groups have their space to represent themselves and get connected to the other activists. Recently the Roma activists started to make different actions in berlin against the deportation of the Roma people to the so called safe Balkan countries which is still going on. You can find out detailed information about it in the last page and also how can you support/join their protest.